A very good question! Black holes are interesting objects, and still somewhat scientifically perplexing ones, particularly when it comes to determining how they interact with the galaxy they live within. As a first filter, though, we can ignore all of the small, stellar mass black holes that hang out throughout the disk of a galaxy. These small black holes, while they’re still fascinating objects, and can produce pretty impressive jets and energy outputs, are nowhere near as energetic as you would need if you want to influence the whole galaxy. Really, we’re only interested in the class of black holes which are found at the very centers of galaxies; supermassive black holes. Supermassive black holes are typically about a billion times more massive than our sun, which is the main distinction from stellar mass black holes, which are only a few times larger than our Sun. Despite how much larger they are, these supermassive black holes are not uncommon — it seems that every massive galaxy has a supermassive black hole nestled at its core. All our observations of galaxies and their black holes suggest that the black holes and their galaxies grow in lockstep with each other; smaller supermassive black holes are found in smaller galaxies, and larger supermassive black holes in larger galaxies. Black holes are actually frequently referred to as “galactic engines,” as they can produce an absolutely stupendous amount of energy: literally millions of times the energy output of the Sun. This energy is usually a byproduct of the extraordinary inefficiency with which it manages to absorb external material in order to grow. The energy produced by the black hole often manifests as a jet of material, flung outwards along magnetic field lines at speeds of a significant fraction of the speed of light. The engine metaphor reflects the black hole’s ability to take a certain material (generally gas, dust, or in some cases, stars) and convert a good chunk of that material into energy; in the case of a car engine, we take gasoline and burn it, converting the gasoline into energy that can power the car. If we run with the car engine metaphor a little longer — cars function (pretty dramatically) differently if their engine is on or off. So if the black hole is “on” — which for black holes means that they’re trying to accrete new material — we might expect the galaxy it sits in to react somehow. There’s so much energy being produced that it seems only natural to think the galaxy should somehow care. This is still an active field of research, and we haven’t quite converged to a consensus on how the black hole should feed back into the galaxy, or if there should be a dramatic impact on the number of stars that galaxy can form, for instance. 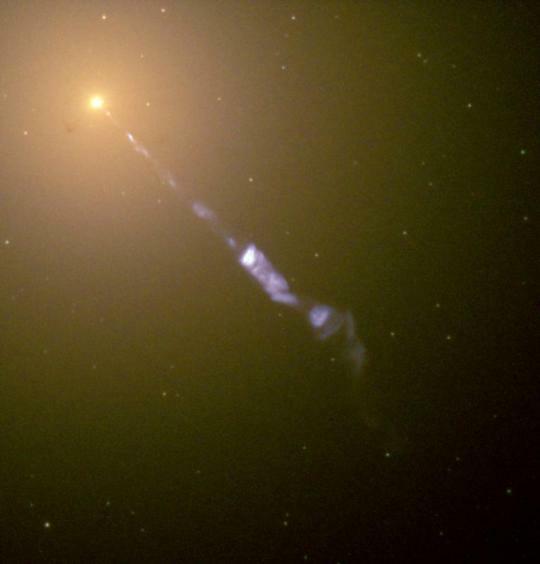 But what about black holes in newly forming galaxies? To examine those, we must look at galaxies which are at extremely large distances from the Earth, where light has taken so long to reach us that we look billions of years into the past. 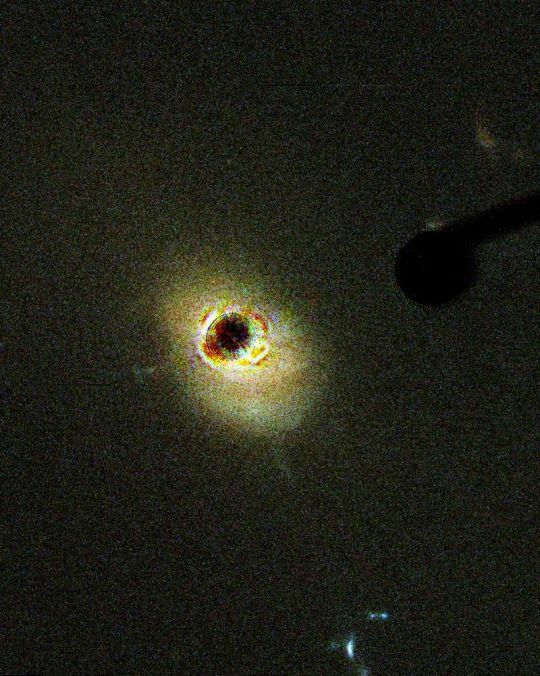 At these distances we discovered an interesting object: a quasar. Quasar is short for “quasi-stellar radio source” (also known as QSOs, or quasi-stellar objects, because they don’t all emit in the radio, after all). 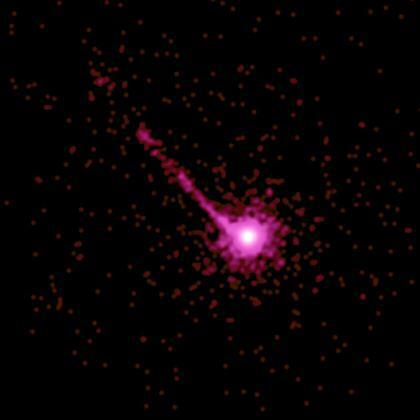 Quasars are extremely bright point sources on the sky like a star (often saturating the camera, causing flares and other unfortunate effects), but when spectra were taken of these objects, their light looked nothing like that of a star. 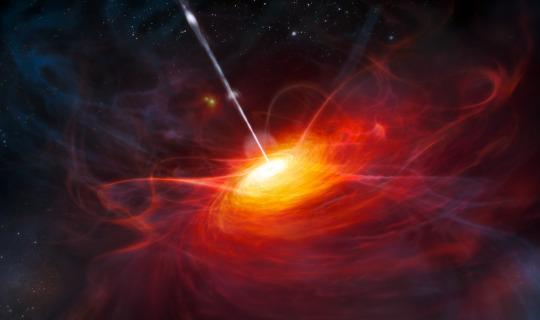 Quasars were rather mysterious for a number of years — because they blasted the camera with light, it was extremely difficult to determine if these objects were actually within a galaxy, and if so, where they were — central or off-center? If they were isolated, and there was no additional galaxy surrounding them, what could cause them? 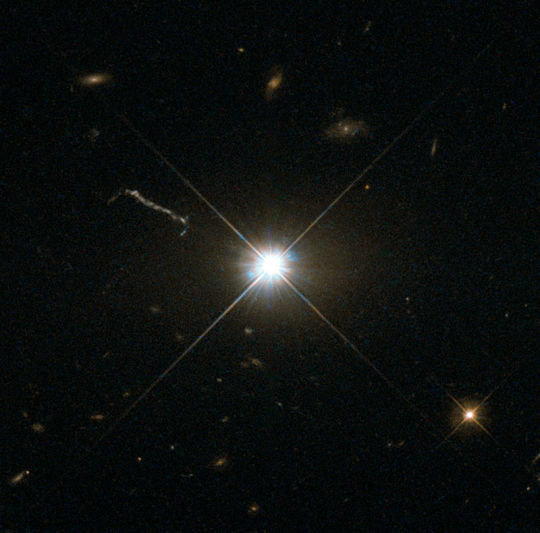 Observing techniques developed, and it became clear that these quasars were indeed in the centers of galaxies, but the galaxies were incredibly faint relative to the brightness of the quasar (hence why we couldn’t spot them before). A number of theories were put forth: merging neutron stars, interacting stellar mass black holes, flares from collisions, etc. But thanks to more advanced techniques, we determined the light from quasars to be produced by the central black hole of these faint galaxies, dramatically outshining the rest of the galaxy. These objects are also much more common at large distances from us than they are nearby — so they tend to exist much more commonly in the youngest galaxies in our Universe. But how did they get so bright? To understand that, we need to poke our noses a little closer in to the black hole. An active black hole (in that it is trying and mostly failing to accrete new material and grow) is always surrounded by a superheated disk of material — an accretion disk — which is swirling around the black hole, gradually losing the angular momentum it needs to maintain a stable orbit, and slowly falling towards the black hole. This innermost accretion disk is often surrounded by a larger donut-shaped ring of dust and gas, which is not quite as hot, and not nearly as close. Perpendicular to the inner disk (and to the dusty donut surrounding it), a jet will form. This jet is mostly electrons and protons fired out at speeds close to the speed of light, and these particles can radiate their energy away through X-rays and radio waves. If you happened to be pointed in a direction that has you looking straight down the jet, you’d find yourself staring down a very bright portion of the black hole, instead of being able to see the glare from a less direct path. It seems that with quasars, we happen to be looking down the jet, or very nearly directly down the jet. It doesn’t seem to be just an orientation effect, though — if it were just orientation, we’d see them nearby, in older galaxies as well, but they seem to be quite rare in the nearby universe. So there must be a secondary thing at work as well; very likely this is the amount of gas hanging around near the center of the galaxy. If there’s not enough gas in the galaxy to hang around near the black hole in that innermost disk, the black hole simply won’t have any material to fling outwards into a powerful jet. In the local universe, galaxies tend to be mostly stars, with less than 25% gas. But much younger galaxies have the percentages reversed; they can easily be more than 60% gas. This means that even without any external effects from things like collisions between galaxies (also more common at these times, and will also help to push gas to the centre of the galaxy), it’s much easier for the black hole to have an easy fuel source to power its huge jets, streaming away from the galaxy! Between the two factors — orientation, and the larger presence of gas near these central black holes — quasars are very much the powerhouses of the early universe!